At least eight pupils of Asumbi girls Boarding Primary School, in Homa Bay County, are feared dead after a fire razed their dormitory on Wednesday night. The victims were among class seven and eight pupils attending August holiday tuition session, holiday tuition was banned by the Education Minister less than two weeks ago. The institution is run by the Asumbi Catholic Church parish. The young girls were burnt beyond recognition, their colleagues in an adjacent dormitory scampered for safety for fear of losing their lives in a fire that is believed to have been caused by electricity fault. The burned dormitory had its windows grilled with wire mesh with no emergency exit. 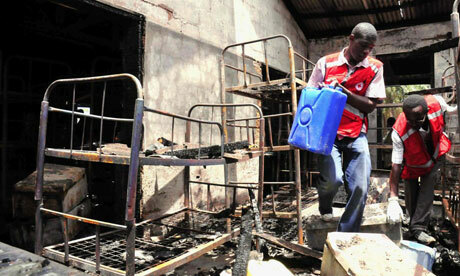 The dormitory is said to have been locked from outside making hard for the pupils to escape or get immediate help. Parents whose children were at the school arrived moments after word on the fire went out. Anxiety was high among parents throughout the night as the school administration did not give any details or give names of the victims. The nuns in charge went into hiding at the convent. The locals who responded to the distress call had to force their way into the institution, the watchman at the gate tried to block them.Â The locals were shocked to find the dorm that was on fire locked from outside with a padlock. The local administration lead by the area DO arrived at the scene and confirmed to the press that they had counted eight bodies that were burnt beyond recognition. The bodies were taken to Homa Bay District Hospital Mortuary. It is not the first time the country is experiencing such a tragedy; a few years ago there was another tragedy at Bombolulu Girls in Mazeras and in Machakos at Kyanguli Boys Secondary schools. The tragedies back then forced the ministry of education to issue guidelines on safety measures; it raises concern as to whether schools administration does enforce the safety regulations. Meanwhile several leaders and the public have expressed shock and disbelief, Prime Minister Raila Odinga has sent condolences to the parents, the families and relatives of the children who perished in the inferno. The PM said the institution has done an excellent work in the past preparing young pupils for high school education and future positive role in society. He called on the ministry of education to ensure that parents affected are given necessary assistance as they struggle to come to terms with this loss. The ministry must prepare to do counseling to students who will naturally be traumatized by this tragedy added the Premier. too sad, ngoxolo-calm, RIP those who left and may their relatives be restored, God with them all the time. very sad why the children?. This is the work of the devil God help the rdmaining children.